We tried to go into the Basilica Cistern yesterday, but the line was outrageous. It wasn’t as bad this morning, but it wasn’t great either. Andrew opted out, not wanting to deal with the tourists inside. It was still crowded, but the Basilica Cistern was a lot bigger than I expected it to be and I spent more time inside than I thought I would. Picking up Andrew on our way out we made our way to Topkapi Palace. 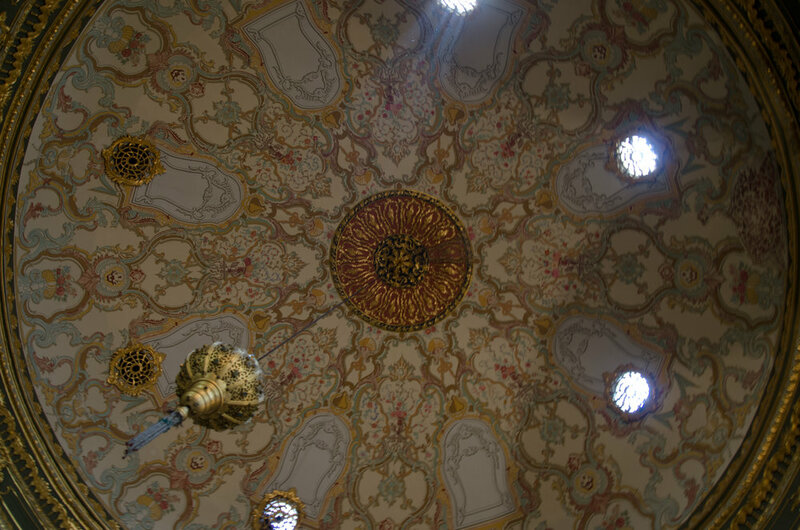 Again, we were face to face with big crowds and long lines, but we tried to make the best of the beautiful palace and kept… looking up in awe at the domed ceilings and intricate tile work throughout the palace. Full disclosure: I first heard about (saw) The Basilica Cistern on a season of The Bachelorette. I know, I know, the SHAME! The blonde bachelorette (I forget her name) was on a one-on-one in the Cistern. It looked unbelievably beautiful (and romantic). It probably helped that they were the only two people there… Because although it was still pretty breathtaking during my visit, it wasn’t quite the same. Instead of the Andrew and me floating on a raft sipping champagne in the middle of the cistern, surrounded by water and the soft glow of candles lighting up the columns… Andrew was waiting outside avoiding the crowd I was caught in below (saying excuse me in Korean to the Korean tourist groups I was trying to weave my way through). 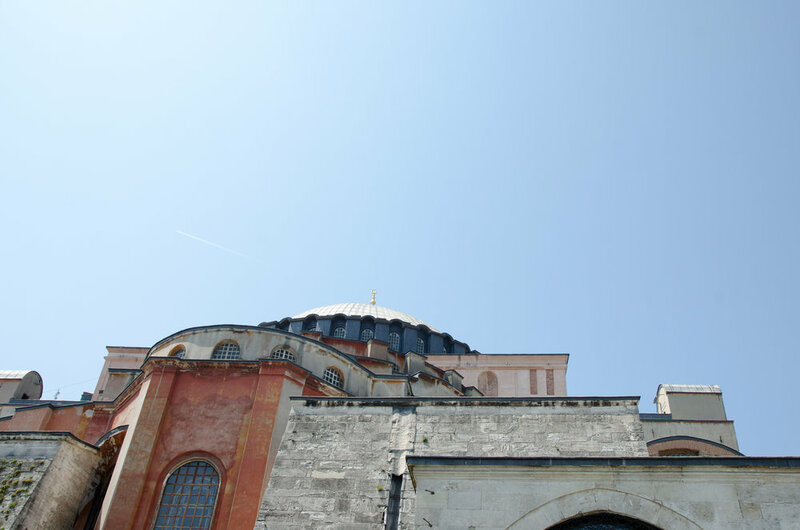 Historically (what it’s known for aside from The Bachelorette) the cistern was built by Emperor Constantine and later rebuilt and enlarged by Justinian. 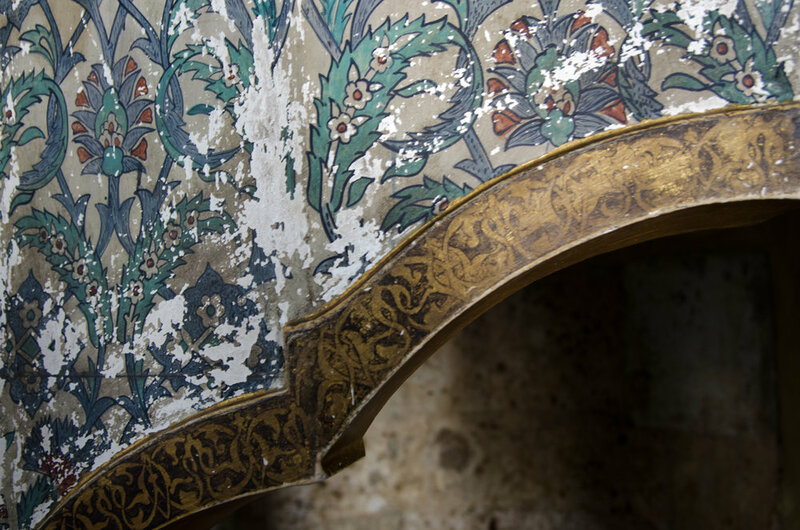 It was used as a water filtration system for Topkapi Palace. I balanced my camera on the railing, praying I wouldn’t drop it and/or slip and fall into the water below. I tried to get a few solid shots, but it was dark and I don’t have the greatest lens for low light. I picked up a bored Andrew back outside of the Cistern and we made our way to the Palace. 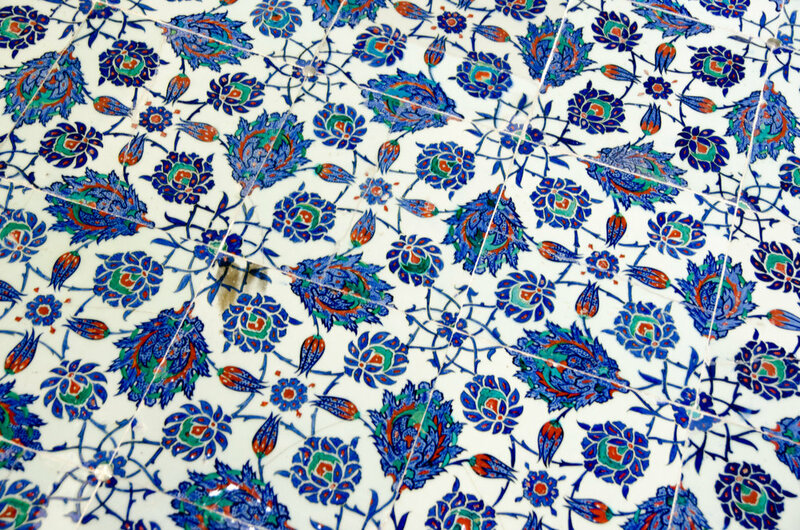 Topkapi Palace is an UNESCO World Heritage Site being “the best example of a palace during the Ottoman Empire.” One of the larger palaces in Istanbul, it was where the Ottoman Sultans from 1465 to 1856. 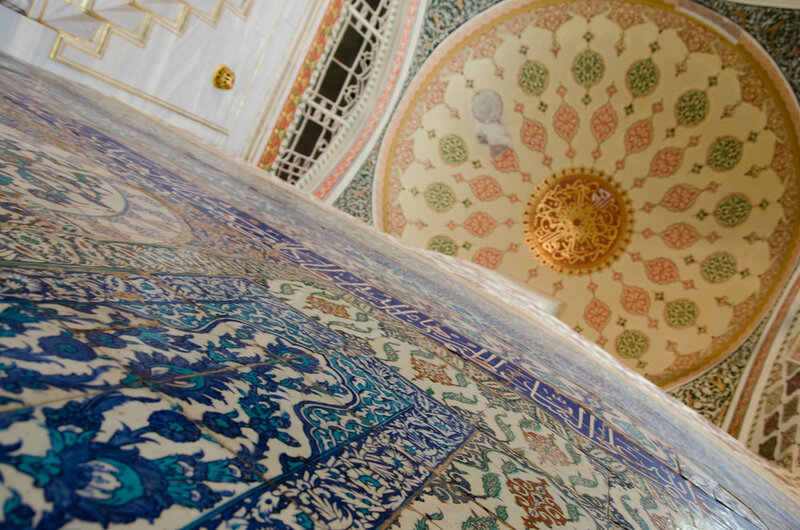 Not only did the Sultans live here, it’s possibly more famous for the Harem and the jewels that are now on display. There are several courtyards, different rooms dedicated to specific events (Andrew’s favorite was the circumcision room for some inexplicably strange reason- I mean, I would think he would want to avoid it… But whatever.) or the usual: like a receiving room and a library to name a few. It also overlooked the Bosphorus in several different places with beautiful views of Istanbul. Instead of fighting my way to get a perfect picture of Istanbul, I tried to embrace the tourists in front of the view and made them my subject a few times. 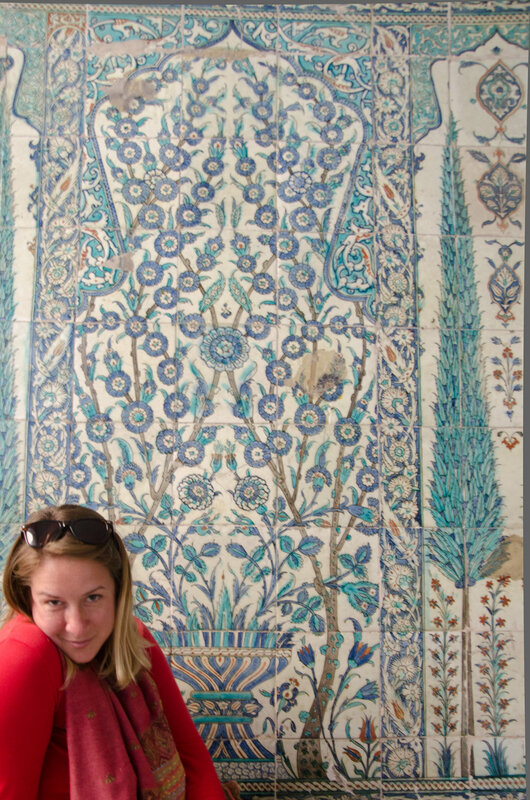 As in Morocco, I was fascinated (and deeply in love) with the tile work throughout the palace. I know, it’s just tile, but don’t you think it’s beautiful? Why aren’t designs like these embraced more often in American architecture? I made Andrew promise me one day our house will feature tile work inspired by walls like these. We made our way out towards the Harem just outside of the main entrance to the palace. It too, immediately had tile work that made my eyes grow wide and smile. Andrew patiently tried to take the perfect picture (for me) of me in front of it. We wandered through the opulence and again, I was reminded of other palaces that we’ve been fortunate enough to visit on this trip. The Harem here reminded me of the harem within the walls of Agra Fort that we visited in India (on Day 85 if you’re interested in revisiting). It’s fascinating to see similarities in buildings, history, etc. from country to country – and sometimes continent to continent on this trip! 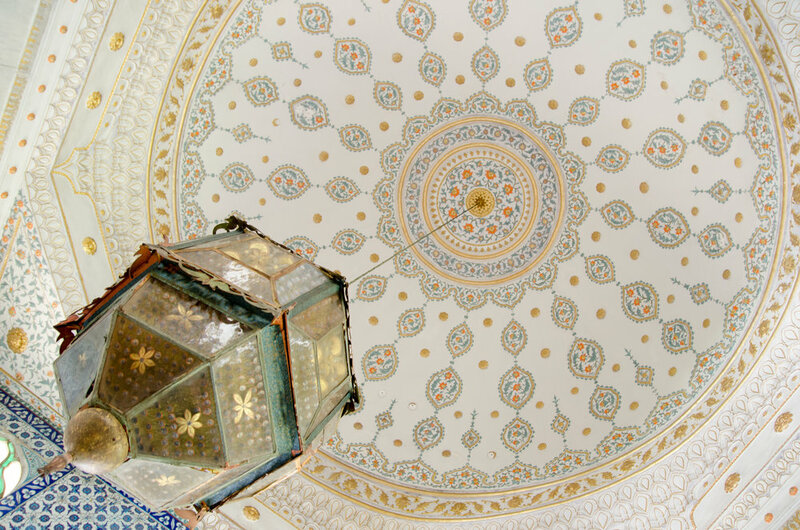 Most of my pictures are looking up, because that was the most beautiful part of the harem. And, well, people were in the way when I tried to take pictures looking straight ahead. But hopefully these images give you a glimpse of what it was like walking through. Can you imagine what life would have been like living in these rooms? Walking out a different way, we passed by the back of Hagia Sophia and I couldn’t resist taking a shot from a different angle.